This guide for new parents will hopefully give you a feeling for what like is like at St. John's CE Primary School and Nursery. CLICK HERE. White polo shirt, blouse or shirt. Uniform without the school logo can be purchased from any shop, however, parents that want to purchase uniform embroidered with the school logo can purchase everything from Matilda and Jack who have a shop in Ripley or Loopwear who have a shop front in Ilkeston and an online ordering service. You can find a price list for Matlida and Jack below and links to both companies websites. At St. John's we want to support local businesses and do not want to let nationally based companies manage our school uniform provision. 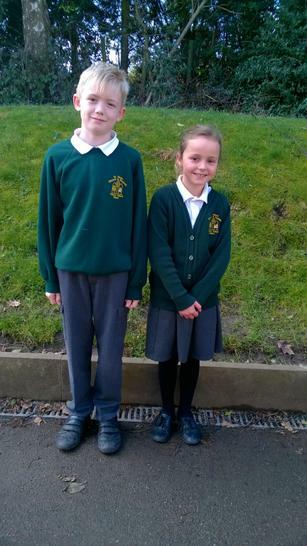 Below is a picture of two children looking smart in their school uniform.